Although AMETEK’s blowers are easy to install, there’s an added level of complexity when using an external controller. In this case, Selas’ HMCT-Pak™ had an external controller that was not communicating with the AMETEK blower. When two people speak, even the same language, communication is critical. Even minute misunderstandings can lead to chaos. Simple, effective communication is critical to success, even at the machine level. When machines don’t communicate with clarity, they lose efficiency or may fail to work at all. Selas Heat Technology Company experienced this in the development of its new HMCT-Pak™ high-velocity burner. The Company’s research first led it to consider a large standard industrial blower to provide the air flow for the new velocity burner, the HMCT-Pak™. 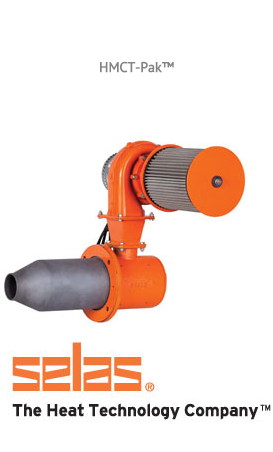 Although a standard industrial blower provided a solution for Selas’ air movement needs it also created a problem. Using this particular blower increased the overall package burner assembly size and weight and posed an issue for customers. The assembly required additional space, reinforcement for mounting, and a two-person installation, creating more work for customers. To resolve this, the Selas engineering team began searching for a smaller, more compact solution for its air movement needs. That’s when the team’s research led it to AMETEK Dynamic Fluid Solutions. AMETEK’s team was able to provide the solution Selas needed through its Nautilair line of combustion blowers. Lightweight and compact Nautilair blowers were the perfect solution. Although AMETEK’s blowers are easy to install, there’s an added level of complexity when using an external controller. In this case, Selas’ HMCT-Pak™ had an external controller that was not communicating with the AMETEK blower. To find a solution, AMETEK Applications Engineering traveled to Selas to experience firsthand what the customer was experiencing. Once the AMETEK team was there, it resolved the conflict between the blower and controller plus the team realized a higher speed was needed for the HMCT-Pak™ and controller to work at the desired performance levels. AMETEK applications engineers were able to increase the flow and pressure performance on site to create the desired speed for the Selas velocity burner. These changes enabled a turn down ratio of 40:1 for Selas’ HMCT-Pak™. When Selas began research on its new velocity burner, there were a number of obstacles to overcome including size, weight, and communication between its controller and the blower needed to provide air flow. There was no out-of-the-box solution, and Selas engineers needed a partner; the answer came from its relationship with AMETEK Applications Engineering. A custom solution was provided to make the new HMCT-Pak™ 60% smaller than the size of competitive blowers, lighter weight and with the performance needed to create a great solution for customers. Selas The Heat Technology Company, Streetsboro, OH, creates high-quality, reliable industrial burners, combustion systems and safety equipment that enhance thermal processing applications. Its products are used in applications that include metals, textiles, ceramics, glass, food and more. To learn more about Selas, visit its website at www.selas.com.